Complete the following phrase by selecting a cereal: ""I'm coo-coo for ______!" When C.W. Post invented this cereal in 1897, he was looking to produce a coffee substitute - a follow-up to the successful Postum beverage he'd developed a couple years early. What he ended up with were crunchy nuggets whose recipe was very close to first cereal ever created in 1863, Granula. 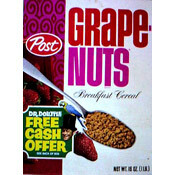 Post called his new cereal Grape-Nuts. The word "grape" stems from the cereal's inclusion of maltose, which Post referred to as "grape sugar". "Nuts" was a reference to the toasty, nutty flavor of the cereal. Post promoted the cereal with an ad campaign that was considered bold for it's time. He positioned Grape-Nuts as "the most scientific cereal in the world". 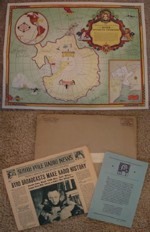 Boxes of the cereal came with the prize of an 11 page pamphlet called "The Road To Wellville" written by Post. In-store tastings and sample give-aways helped to entice consumers and Grape-Nuts became an almost instant hit. 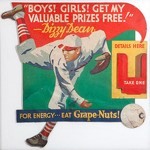 A spin-off of the cereal called Grape-Nuts Flakes appeared in the early 1930's. Grape Nuts Cereal was responsible for the creation of The Andy Griffith Show. In the late 1950's, Post cereals sponsored a TV series called The Danny Thomas Show. The lesser known TV show took place in New York City and had a city-slicker vibe that didn't jive with some of Post's more wholesome cereals. To help promote Grape Nuts, writers created an episode that brought Danny Thomas to a wholesome, all-American, small town called Mayberry. This was America's first introduction to Sheriff Andy Taylor, one of television most beloved characters. In 1960, a spin-off of the Thomas show, The Andy Griffith Show, premiered. During the original airings, commercial breaks featured Andy Griffith and co-star Don Knotts professing their characters' love of Grape Nuts and Grape Nut Flakes cereals. The Andy Griffith Show ran until 1968. "I have used Grape-Nuts now for more than a year and I am now entirely strong and robust, entirely cured from drink and able to work hard everyday. My gratitude for Grape-Nuts is unspeakable, as it has saved my life and my reputation." "Grape-Nuts isn't just part of your breakfast - it's been a part of American history for over 100 years. Take a trip down memory lane with Grape-Nuts packaging and advertising. "1895 - Energy for Discovery: This year saw the debut of the motion picture projector, the wireless telegraph, the X-ray, and C.W. Post's cereal company. "1897 - Better than Gold: Mr. Post introduces Grape-Nuts believed to be named after the "grape sugar" that formed during the baking process. "1955 - Every Little Bit Packs a Wallop - America turned Grape-Nuts for energy - it even helped take an explorer to the top of Mt. Everest." Very early packages of Grape-Nuts described the cereal as a "compound made of wheat, barley, salt and yeast. In 2010, the ingredients listed for Grape-Nuts were whole grain wheat, wheat flour, sugar, malted barley flour, high oleic vegetable oil (canola or sunflower oil) and salt. These are the most recent images. Click here to see all pictures for Grape-Nuts. What do you think of Grape-Nuts? View all 30 comments for this cereal. I love a bowl full with a sprinkle of sugar and a couple of handfuls of raisins! I love them with hot milk! I just nuke them for 2 minutes. 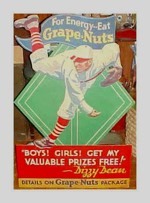 I've always just LOVED Grape Nuts! Did anyone mention here that you can eat also them like oatmeal, warmed up with milk? Either way, I love them! 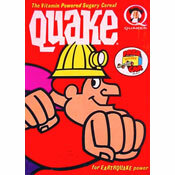 My 3rd fav milked cereal from childhood... and back then, as I recall, something of a real chew-challenge....I still enjoy a box or two a year, although they seem easier to chomp... boohoo. Friends, have you ever found yourself rushing out in the morning because you weren't hungry, or didn't think you had the time? You can't do a man-sized job on a bird-sized breakfast, you know. Nutrition experts say that morning is the time when we should stoke up, and get at least 1/4 of our daily nourishment. Nutrition experts also recommend a whole grain cereal, and that's Grape Nuts and Grape Nuts Flakes. Both are Basic 7 foods, outstanding in both their whole grain nourishment and their zesty crispness. So, eat a good breakfast, do a better job, with those toasty-brown, malty rich, sweet-as-a-nut Grape Nuts or Grape Nuts Flakes, for extra swell eating! Post added soy isolate to Grape Nuts in 2013 in a misguided marketing effort to capitalize on the "more protein" fad. Consumers must have thoroughly rejected this addition, as 2014 brought the soy-free formula back to the market! Who eats this stuff? Maybe people feed it to their horse. Or their rotten kids as punishment. Awful bowl of pain. I don't care for Grape Nuts, but I LOVE Grape Nut Flakes. I love them - my second favorite cereal after Force. I bake with Grapenuts all the time. I just add a 1/2 cup to my muffin and coffee caker recipes and it makes the texture a lot better. Love it as a cereal too.